Are You Happy? Take Control. This gentle and nurturing 26 minute session is made with love and designed to support you, wherever you are today. Use the tools of pranayama to calm the nervous system as Adriene guides us through this special session. Relieve stress caused by trauma and bring loving awareness to guide the mind and heart to the present moment. Rebel developers are trying to break our society's addiction to smartphones with an app. They are using fire to fight fire — creating apps that try to put users back in control. They call their movement “digital wellness,” and it has seen some major victories so far. Read the full article to find out what your smartphone will look like soon! Do you remember that moment when creativity and productivity sprung from your mind smoothly? According to positive psychology cofounder Mihaly Csikszentmihalyi, this state is called flow, and it is an important contributor to creativity and well-being. His research, found in this article, he shares how the experience of flow is universal and has been reported to occur across different classes, genders, ages, cultures and activities. If you’ve ever heard someone describe a time when their performance excelled and they used the term being “in the zone”, what they’re describing is an experience of flow. It occurs when your skill level and the challenge at hand are equal. Click on the link below for more information. Listen to this mindfulness meditation to help you calm yourself. Can you predict how you’ll feel in the future? The anticipation of an upcoming experience or event is inevitable but are you accurately predicting how you’ll feel as its happening? Often times, these predictions can lead to decisions that are counterproductive to our happiness because we are making choices based on how we think we’ll feel in the future with little information to go off of. NPR’s Hidden Brain Podcast explores the research of Dan Gilbert, Professor of Psychology at Harvard University, and his insights into how having a little “blind faith” can go along way for your happiness. Sometimes, feeling bad is necessary and good. How great would it be if you had complete control over how you feel? It’s likely you would rid yourself of negative emotions and hold on to only the good ones. Studies show, however, embracing all of your emotions can actually lead to you feeling happier. Read this article to find out more. The average Facebook user spends almost an hour on the site every day, according to data provided by the company last year. A Deloitte survey found that for many smartphone users, checking social media apps are the first thing they do in the morning. Thousands of studies have concluded that most human beings thrive when they have strong, positive relationships with other human beings. So, while we know that old-fashioned social interaction is healthy, what about social interaction that is completely mediated through an electronic screen? When you wake up in the morning and tap on that little blue icon, what impact does it have on you? The meanings of life Happiness is not the same as a sense of meaning. How do we go about finding a meaningful life, not just a happy one? Find out in this article by Roy F. Baumeister. Research shows that people who can find meaning in tragedies or challenges that they face in life can be happier and more resilient. Learn about several studies that were performed which show the positive effect finding meaning can have on a person's happiness and way to practice this by watching this Happy Hack. This month Project 40 will help you identify, develop, and strengthen your personal coping skills. Cultivating your coping skills, in both problem solving coping and emotional coping, will help you manage stressful and traumatic situations better. So watch the Happy Hack on Coping Skills to learn more about how you can build the tools to thrive and be happy. Martin Seligman explains pessimistic explanatory styles and learned helplessness in his book "Learned Optimism". I found this book to be very interesting and an awesome read that was worth my time, and I recommend it to anyone wanting to learn about depression. Glass half-empty or half-full? Does it really matter? As it turns out, it does matter how you explain that glass and the world around you. Those who explain things one way are better salespeople, have less depression and are more motivated than those who see things the opposite way. The good news is that if you can recognize your language pattern, you can do something about it and actually change how you respond. Read this article to find out how! During the winter months it can be hard to stay positive. The short days, decline in outdoor activities, and overall lack of sunlight can take both a physical and mental toll. That's why this month Project 40 wants to help you choose to be optimistic. Whether it's telling yourself you can accomplish your goals or finding the positive in a difficult time; optimism can increase your happiness. Watch this happy hack to learn more about the research behind optimism's benefits and learn ways you can practice it in your own life. Why do so many people fail at goal-setting, and what are the secrets behind those who succeed? The explosion of studies into how the brain works has more experts attempting to explain the science behind why we make resolutions—and more relevantly, how we can keep them. Are you already part of the more than 90% of people who fail to keep their New Year’s resolution? Now is a great time to recommit yourself to your goals. Reaching your goals has been proven to increase your happiness. So check out these strategies that can help you to commit to and achieve your goals. Olivia Newton John getting "Physical" in her 1982 music video. Physical Wellness is key to being a happier and healthier person. To be clear, that doesn't mean you have to work out 7 days a week to be happy. While physical wellness includes fitness, it also means to take care of your physical self, including things like nutrition and sleep hygiene. This month, Project 40 is going to be embracing its inner Olivia Newton John as we promote, "let's get physical" to our campus community. With the new year, it is a great time to take on this slogan and think about how you can start fresh with a focus on showing self-compassion through physical wellness. Watch the Happy Hack to learn how you can get started! We often feel compelled to get things perfectly right every time and that getting something wrong is an admittance of failure. It’s expected, we live in a culture of high standards and demanding work. This is stressful and we all need to accept our failures and learn from them, faculty/staff and students, alike. Failure is part of the learning process, in this NPR article researchers explore the benefits of discussing mistakes and understanding when things go wrong. Research clearly shows that strong social connections make you less anxious and depressed. It increases self-esteem, empathy, and helps you better regulate your emotions. There are physical benefits as well, connection also increases a persons immunity and longevity. The emphasis is not on how many friends you have, but rather how much you connect with another person. Watch this happy hack on making strong social connections to learn more about the benefits and how you can practice this strategy. Saying “thank you” is not just about being polite. Research shows that the words are much more than a formality. Social relationships are integral to being human. If we are at work, school, home, or anywhere, we are constantly interacting with others. Showing gratitude to those you rely on and work with results in a more positive and thus more effective and mutually beneficial relationship. Identify three times where saying “thank you” to someone else prompted each of these functions for you. Think about how you can strategically use expression of gratitude to build relationships in your co-op or career. Gratitude is a felt sense of thankfulness, wonder, and an appreciation for life. From being thankful for your dearest loved one to having the perfect cup of coffee, gratitude can be felt for a range of everyday occurrences. But being grateful is often easier to talk about than actually practice. However, being actively grateful has been scientifically proven to increase your level of happiness. Watch this Happy Hack for more information on what gratitude is and ways you intentionally practice. Sometimes we choose efficiency over enjoyment. The most direct path from point A to point B. Granted it may save you some small amount of time, but it is important to remember that happiness is found in the journey not the destination. Don't take our word for it, watch Daniele Quercia, Scientist and Engineer at Yahoo! Labs, talk about how he discovered the importance of literally finding the most enjoyable path. did you know that being kind makes you healthier? People who are kind produce 23% less cortisol (the stress hormone) and age slower than the average population. It’s true! Engaging in acts of kindness actually lowers blood pressure and reduces stress. Read this article for more benefits of kindness and ways you can practice! In October Project 40 will be challenging you to practice kindness. Research shows that practicing kindness can have beneficial effects on your overall health. Find out more on how to practice kindness by watching our Happy Hack. Keep in mind that even the smallest act of kindness can make another person's day! Listen to Katie McKenna talk about the story behind "How to Get Run Over By a Truck"
People often sat, "I feel like I've been run over by a truck." Katie actually was. Her memoir is about a body that was crushed by a truck, and a spirit that refused to be. Come listen to her inspiring tale of resiliency. Katie will be signing copies of her book on Tuesday, September 27, 2016 at 12pm in Beatty 033. Advanced copies are on sale at the Wentworth Book Store. Mindfulness is often talked about in the context of positive mental health; as a means of centering yourself during times of stress or to remember to savor a particular moment in time. But the act of being mindful of oneself and one’s surroundings can easily translate to an area we at Wentworth are much more familiar with: problem solving. Regardless of the major, we’re in the business of problem solving. Allowing ourselves to be mindful even while we work doesn’t mean we’re not working as hard. How many times have you agonized over trying to solve a problem only to finally give up, go to bed and have the answer pop into your head the moment you’ve allowed your mind to rest? It’s no coincidence. A centered, focused mind does a much better job at sorting out problems than a cluttered and confused mind. Athletes might call this, “the zone”, when nothing exists but exactly what you’re doing in the moment. But I think we’ve all experienced it, when you’ve been coding for hours and never realize how much time has gone by, when you’re in the lab building something really cool and just get lost in the build, when you’re absorbed in Photoshop, RevIt or Solidworks and every line or brush stroke just flows into the next. It’s so easy to get wrapped up in the barrage of media, social and electronic stimuli in our day to day lives that we can feel overwhelmed when it’s time to actually sit down and do work. Take a moment to center yourself before a task, bring complete focus to that task and be grateful that you have the opportunity to work at something you care about (and not simply fight to stay alive) everyday. For the month of September, Project 40 will be focusing on the practice of MINDFULNESS. So we want you to take a minute to PAUSE and be present in the moment. Guided Meditations - Free mindfulness meditations that you can practice on your own from the UCLA Mindful Awareness Research Center. Insight Timer - Free mindfulness mobile app. Calm - Free meditation mobile app. Head Space - Free online mediation guides. Balanced - Free mindfulness and motivation app. Mindful - Online mindfulness magazine. Meditation Vacation - Free online meditation course. Check out the HAPPY HACK for each strategy to find out how to practice the skills that will build your resiliency and happiness. Don't miss your chance to WIN a FREE Gift Card because you can't forgive! This month learn what forgiveness actually is and how practicing it can be to your benefit. The tools to having fewer physical symptoms of illness and increased positive emotions can be found in this happy hack. Want to win a free Gift Card!? To enter just tweet or post to @WITProject40 and tell us what is your daily self-compassion mantra! * You can also pick up a Project 40 wristband to take part in our self-compassion exercise in The Center for Wellness! Using Self-Compassion to nourish both your mind and body can lead to you being happier and healthier. Learn more in this month’s Happy Hack. Want to win a free Gift Card before summer break!? Then to enter just tweet or post to @WITProject40 and tell us what your go to optimistic line is or your favorite optimistic quote. 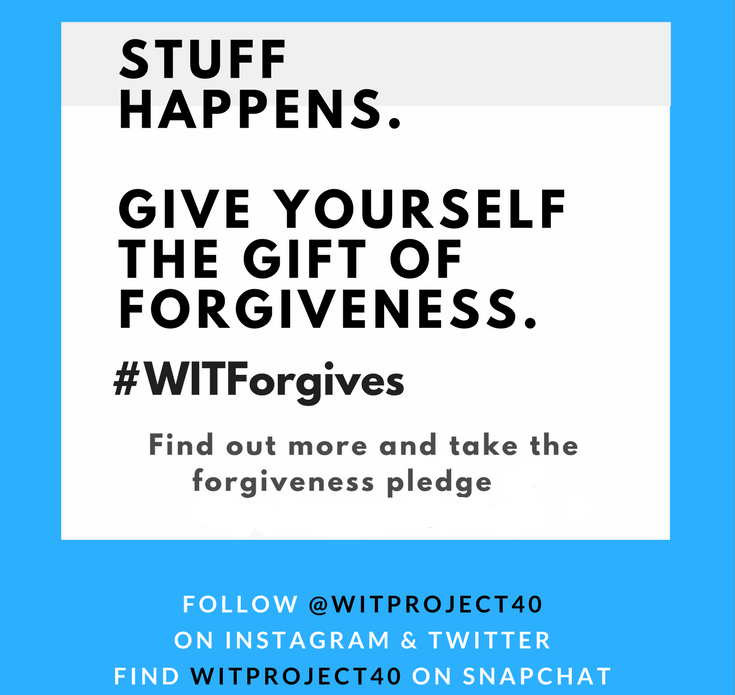 Post or Tweet a coping skill you use to @WITproject40 on Instagram or Twitter using #copeWITit and be entered to win a FREE GIFT CARD!! A chalkboard stood in the middle of New York City asking passersby to write down their biggest regrets. As the board filled up, we noticed that all of these responses had one alarming thing in common. 3. Plus you could win free money! WATCH THIS MONTH'S HAPPY HACK TO learn how to make goals that are right for you and that you will follow through on. Wild Words - Thursday, 1/21/16 at 6pm - a poetry/open mic night at Pavement Coffeehouse. It is a opportunity for students to express themselves in a safe, accepting and supportive environment. Weekends@WIT's The Price is Right - Saturday, 1/23/16 at 9pm - Join Weekends@WIT on Saturday, 1/23/16 at 9pm in EWT Auditorium for your chance to play The Price is Right. There are loads of prizes to win and plenty of opportunities to connect. Senior Kick-Off at King's - Friday, 1/29/16 at 8pm - Open to the entire class of 2016! Kick off Senior year with a night of bowling and fun at King's! Tickets on sale now at the Info Hub and Campus Life. Weekends@WIT's Hungry, Hungry Hippos - Saturday, 1/30/16 at 9pm - Ever wonder what it would be like to play life sized hungry hungry hippos? Join Weekends@WIT on Saturday, 1/30/16 at 9pm in EWT Auditorium to find out! To find out more about Look Up or about Gary Turk the award winning director of the video, please visit the link here. This month, in honor of promoting stronger social connections, Project 40 is not having a social media challenge. Instead we ask that you look up from your mobile devices and interact with the world around you! As a reward for doing so you could win a gift card to share with a friend. Watch this month's Happy Hack to learn about making better social connections and how doing so will improve your overall health and happiness. The most useful skills for success won't be learned in a classroom? First and foremost, nothing will ever change the fact that your education is one of your most valuable assets. In terms of a career it is extremely important to have a strong knowledge base in your field of study. However, lots of research shows that academic and career success are more closely linked to several “non-academic skills." Check out these articles and Project 40’s initiatives to learn more about these skills and how to develop them. Learning Lab. "Report: Non-Academic Skills Are Key Ingredient To Student Success"
NPR. "Nonacademic Skills Are Key To Success. But What Should We Call Them?" Post something kind about someone else in your life and mention them. You could win a free gift card!! Enter to WIN A FREE gift card! Show someone at The Center for Wellness, Dean's Office, or the Info Hub that you completed the challenge to get your Project 40 Gratitude Journal and be entered to WIN A GIFT CARD!! Watch this month's Happy Hack to learn what gratitude is and how practicing it can increase your happiness! Do you suffer from Sunday Evening Dread? For some people having a case of "the Mondays" begins a bit earlier than when the alarm goes off on Monday morning. In our anxiety ridden society, dreading Sunday evenings is widely becoming an issue for many people. The idea of beginning another hectic week of work has slowly begun to trickle over into our weekends. So what can be done? Follow the link to find out 3 tips from Nataly Kogan to avoid dreading Sunday evenings. Watch this brief video of Sonja Lyubomirsky discuss how much of our happiness is determined by our genes, and how much is within our power to control. WHat did nataly Kogan learn about being haapier? Read Nataly Kogan's 3 Tips to becoming happier from her Huffington Post article, "3 Things I Learned About How to be Happier. " Come watch Nataly talk on Tuesday, September 29, 2015 at 5:00pm in Blount Auditorium. Find out what unconditional joy is, how to find it, and why it’s the most important thing you can do to live a meaningful and successful life. Take a look at this month's 3-part Happy Hack series on what happiness really is and how Project 40 can help you actually BE HAPPY! Nataly Kogan - "Sharer of joy"
Check out the following TedTalk with our upcoming speaker, Nataly Kogan, on how we can be happier! And then come hear her LIVE at Wentworth on September 29th at 5:30 in Blount Auditorium!